Discussion in 'Mac Apps and Mac App Store' started by FroYoSoft, Dec 17, 2014. I do have a limited number of promo codes available upon request, and the launch special price for Sound Booster is currently $5.99. This is an initial release, so any feedback is welcome and appreciated. 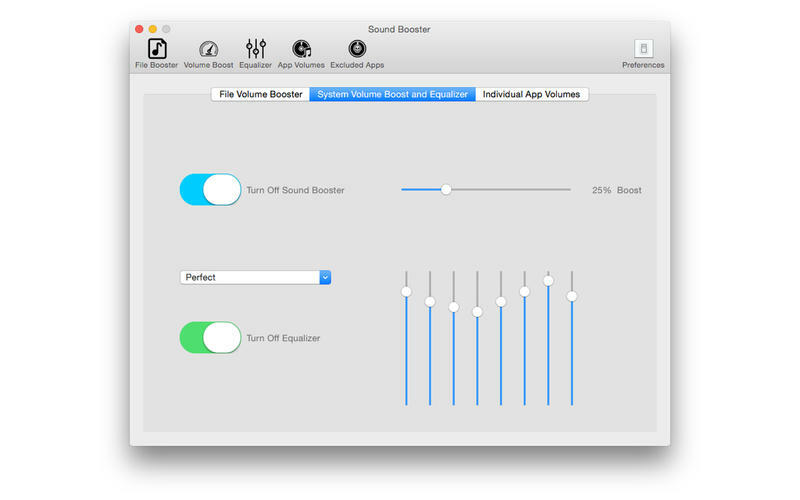 You can find out more information about Sound Booster on the official FroYoSoft website and/or the Mac App Store. I am interested in trying out your app. The individual app volume looks like a good feature. Could you please PM me a code? I'd like a PM code as well. This might be the app I've been looking for. So....you essentially do what Boom does - but cheaper for a single machine license? I'm not a huge fan of direct comparisons to competitor products but since you brought it up, Sound Booster is like the combination of the best of Boom and Sound Bunny. It may not have as slick of an interface right now, but under the hood it's just as powerful (if not more so) than either one of those products. Not to mention the current price is less than a quarter of their price tag, and it's more system resource friendly and less clutter because Sound Booster is doing the job of two apps in one. But, you may say that I am biased. So if you'd like to try I would be happy to provide you with a promo code and you can verify for yourself. So if you'd like to try I would be happy to provide you with a promo code and you can verify for yourself. With the screenshots you have posted here I prefer the look of your app to Boom, it's more 'Yosemite-like' and fits in better to Apple's new visual design philosophy. Boom is a bit garish in comparison. However I can only judge on your screenshots because you haven't PMed me a promo code. Looks very useful. I would love a promo code! I have been provided a code by FroYoSoft and have now been using this app for a few days. It has made a significant difference to my iMac and the control I have over my internal speakers. Take note that I do not use any external speakers. I like listening to my music while working away and have a wide range of music I like. From Classical right to Rock and then to Country. This app has provided me with the ability to listen to each style of music differently instead of the way Apple wants me to listen to it. It does not turn your internal speakers in to Bose, but it sure improves the quality of the sound coming out of the internal speakers. I can not compare this to any other audio app, but would certainly recommend this one. Thank you for the Promo! Really appreciated! I am interested in trying the app. Can I please receive a code? I would very much like a promo code, and could provide feedback on how it sounds on a MacBook Air 13", if that helps. Would love a promo code as well. I would like to see what this is about also. Other than the one poster above has anybody actually received a promo code? Because I haven't despite requesting one a while ago. And what happened to the other thread? Because I asked on there as well. Not sure where the other thread went. I had left feedback in regards to the app. Pretty much the same as I have left here. It is a pretty decent app. I just hope that the OP responds back to the request. Hey guys, I'm trying to send out the promo codes, but having some trouble trying to get PMs working. Seems like it has something to do with the fact that my account is new. It says to wait 24 hours so I will check back soon. steve23094, Tigerman82, Allograft, PBGPowerbook, and Mr. McMac: check your PMs, you have a promo code for Sound Booster. Enjoy! I'd definitely like to check this out! I'll submit a review in the store -- thanks!